Spectrum and She-Hulk join Blue Marvel on one of his global adventures – against a threat that could break Adam’s heart! It’s White Tiger versus Tiger God – with Ava Ayala’s soul in the balance! Art- Valerio Schiti is still here on art and he’s seen some improvement. There is now a clear distinction between the more senior Blue Marvel and the more middle aged She Hulk and Monica while Ava is clearly a teenager. Black Heroes– Roll call: Luke Cage our fearless leader is here! Monica Rambeau, Ava Ayala, Power Man and the mighty Blue Marvel are also here. Villain- I’ve been dying to see the Blue Marvel’s kids for quite awhile now. I never expected any of them to be a villain. At the start of this series I got a chuckle thinking about how through Blue Marvel, Marvel comics could have its own superhero family. This issue we are introduced to Dr. Positron, a clearly youthful villain who quips about liking Austin Powers and taking every cliché from James Bond villains to the extreme. He is highly entertaining and deliberately stereotypical. The big reveal will leave a great many Blue Marvel fans with their mouths open. W.E.S.P are also introduced…..who the hell are they? I can’t wait to find out! Cover– Greg Land is on cover duty this month. 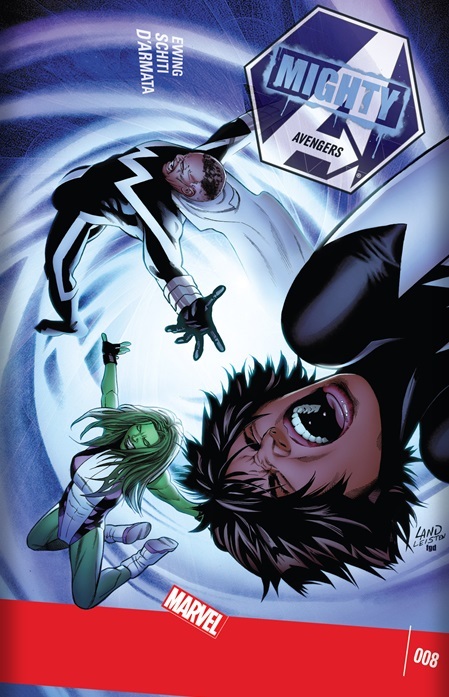 It illustrates Monica Rambeau, She Hulk and Blue Marvel being sucked into the vortex of the neutral zone. Colors and hues of blue are predominant bathing all three heroes. It’s a neat looking cover though not eye popping enough to stick out on a comic book stand. Action-Our trio of Monica Rambeau, She Hulk and Blue Marvel taking down the W.E.S.P bots was awesome! 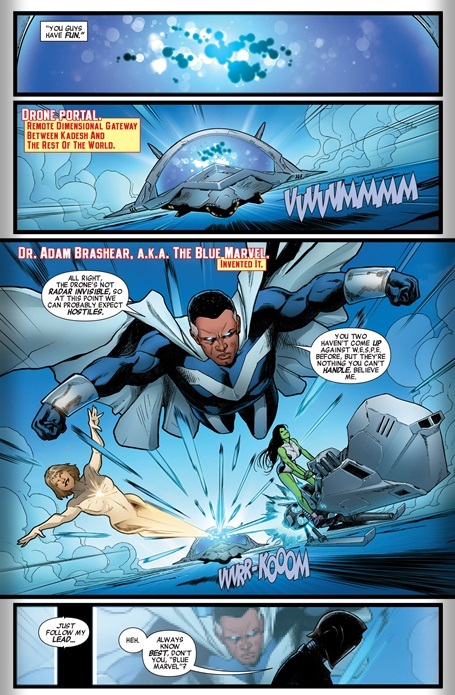 Technology– Blue Marvel’s toys get shown off this issue. From his undersea base, “Kadesh” to the holding facilities contained therein for “Thanos level threats”. The drone portals also seem quite fascinating…..Just how many are across the world? Continuity– I love Ewing’s attention to detail and the nods to what’s currently happening in the wider Marvel Universe. Victor tries to contact both Wiccan and ‘young Loki’ a nod to the young Avengers failed re-launch. Even the dialog boxes containing the text were the same. Bad Romance– The blossoming feelings between Ava Ayala and Power Man can’t possibly end well. Victor is a hot head and clearly Ava has a death wish and a connection to a very powerful god. Together they have incredible power but since Ava is this team’s ‘Wolverine’, Victor better be careful she doesn’t take him down with her. 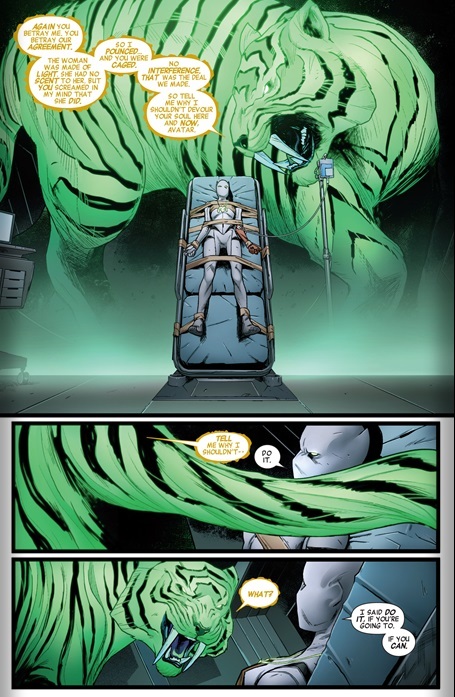 The Avatar– This issue Ava Ayala stands up to the ‘Jade Tiger god’ and manages to regain control of her body. She has also now clearly made an enemy of this god. If he finds a new avatar she is f***ed! Anti-climatic– It would have been far cooler to at least keep the identity of Dr. Positron for one more issue. The pages leading up to the reveal had my brain swirling with possibilities. He was fresh and amusing to boot. Getting some mileage would have better than revealing his identity right off the bat. Art– While the art is improved a new reader will be hard pressed to tell at a casual glance that Luke is not a few years older than Power Man.